This book covers the fundamentals of mechanisms, kinematics and dynamics of machines, taking a theoretical approach while also presenting a number of analytical approaches. 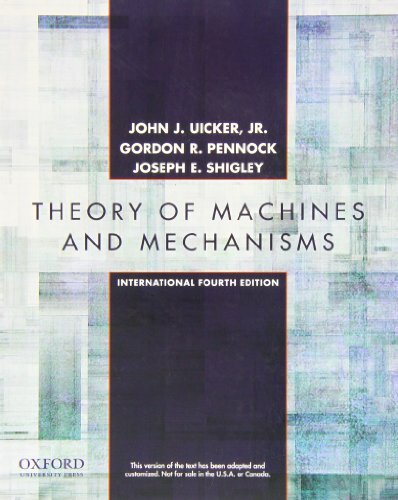 Theory of Machines and Mechanisms is known for the simplicity and clarity of its writing style and its economical coverage of a large number of topics. The revised international 4th edition includes more worked examples throughout the text and new and updated end-of-chapter homework problems. Some subject matter has been condensed (chapters 7, 8, and 9 are now a single chapter; chapters 21, 22, and 23 are now a single chapter) and material is added on synthesis and curvature theory. There is a new Chapter 5 on multi-degree-of-freedom planar linkages and Chapter 14 is completely new. Uicker, John J.; Pennock, Gordon R.; Shigley, Joseph E.